10 August 2017, at 6:00a.m. 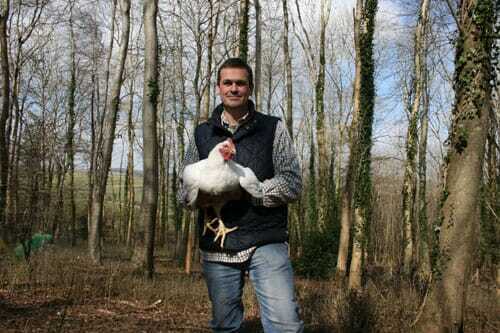 Ffinlo Costain meets Daisy’s Woodland Chicken: a small, high welfare farm enterprise based in four acres of broadleaf woodland in Dorset, UK. 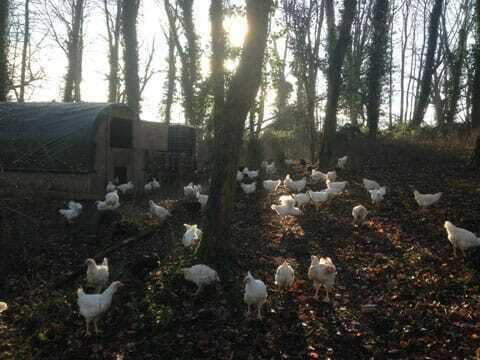 Its owner, Paul Parker-Goadsby, supplies just over a hundred free range woodland-reared chickens a week to local restaurants and farm shops. He has six sheds, each with 250 Hubbard 57s that grow for at least 10 weeks, or 12 weeks for a good family-sized bird. In 2016 he won the Taste of Dorset Award for best meat and fish producer. The idea came from their jungle heritage. If you stick chickens in with cover they’ll spend more time outside, so they get a better texture from moving around. They get a better flavour because they’re out all day milling about, scratching, seeing what can be found, and they take longer to grow. You add that age, it’s all flavour, and it makes a big difference. We’ve been going four years now. We started up with literally £600, which was nowhere near enough! I was producing 100 chickens a month, supplementing the business with carpentry, gardening and delivery work. I was growing the chickens for 18 or 20 weeks; growing them to huge sizes, and then making chicken sausages to sell at the markets. I could sell chicken sausages until the cows come home – but I was actually losing a small amount per pack, so the more I sold the bigger the hole I was digging, because I was having to outsource the cutting and packing. Now I’m just doing whole chickens, and just last year I started sticking extra houses up and the business started to grow. I’ve got to take some brave steps to make the business profitable. To make a profit we have to do our own slaughter. At the moment I’m paying someone £2.20 a bird to slaughter and dress my chickens. That’s 30% of the cost, and it doesn’t matter if it’s a smaller 1.5kg bird for a pub chain I sell to, or a massive high value chicken for Christmas – the cost is still the same. The other issue is that around 10% of my chickens will get damaged at slaughter – they’ll get bruised, usually on their wings, as obviously they’re hung upside down on the pulley and they start flapping. The on-site vet will cut the wing off, so I have a perfectly good chicken that’s now grade B and I can’t do anything about it. They’re also wet-plucked and don’t last as long or look as nice. Will killing your own birds be expensive? I’ll need a walk-in fridge with enough room for 250 chickens to cool and hang, that’s the expense. We’ve got the space, but we need to build that facility. You can get a grant for 40% of the cost of the equipment, but you’ve still got to find the money up front. We’re going to take a pause to raise the capital to do that – and then when we come back we’ll increase production too. When I catch my own chickens I pick one up at a time, with two hands. They get well treated. When I kill them I’ll be using a cone and there’ll be next to no damage. You put them in a cone and there’s no flapping; much less stress for the chickens. What other changes are you planning? The sheds are stationary, so it’s labour intensive to dig out the bedding and change the woodchip around the doorways. I want to rent woodland where I can have a strip of field next to the trees, with houses on skids. The chickens will open straight into the woods, but the houses would be accessible from the outside. For me, chicken has got to be high welfare; it’s got to be free range at least, and it’s got to be British. 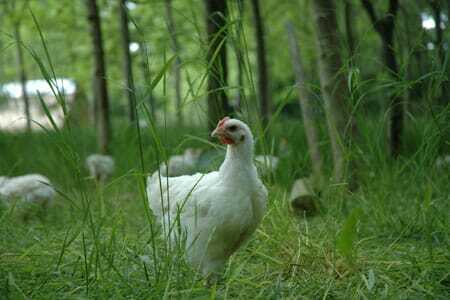 My chickens are reared in broadleaf woodland, and free to perch, scratch and root around. The system itself is low impact and sustainable, but there are improvements with anything. In the future I want to be able to catch my own water. At the moment water comes from the house and I have to get it down there. Each shed has an IBC, and for a batch of chickens I’ll be going through 2-3,000 litres of water depending on the weather. The chickens go in at dusk and get locked away, and I have to check the fences regularly to make sure that deer haven’t caused damage that will let foxes in. The fences are electric at the top and bottom, but the best thing to use is electric poultry netting because even if the electric fails the foxes don’t want to climb it. The risks from deer and foxes can be mitigated. The main predator I have to worry about is buzzards – you can’t keep a buzzard out. I get over that by leaving culled or dead birds out on the track. How did bird flu affect you? As it went on and on it was a lot more work, and a lot more cost. I went through a lot of bedding, and a lot of extra feed. The chickens were just stuck indoors, bored to tears, eating all the time. Then, even though they’re vaccinated, we had a shed that caught Marek’s. That was 250 chickens just written off. In a couple of sheds coccidiosis went up as well, so they were a bit knocked back. Have you had other bird health issues? We had a problem with contaminated water, but this was down to me learning as I went along. At first I had water in open troughs outside, and then we went indoors with small bore water pipes fed off the IBCs. I didn’t take into account the time that the water spends in the pipe when the chicks are small and brooded in the house at 34 degrees. The water moves slowly and you get a build-up of bacteria in the pipe. I hadn’t been cleaning it through properly, so this dirty water started killing some chickens and affecting others so they wouldn’t grow properly. Now I have set protocols in place to flush the system and clean it out properly. Was your background in graphic design helpful? Branding is critical, so my background helped set me apart. A lot of people will ask for Daisy’s Woodland Chicken by name. In a farm shop my chicken will sit next to a standard free range bird, and maybe an indoor chicken, and mine has to say something different. The brand is hugely important and would have been quite a big expense, but I could do all that myself. You said you’re planning to take a break? We’re going to have a pause, build up some capital, and then come back because there’s a lot a lot of support out there. Last year we won the Taste of Dorset, which was shocking and great at the same time. The people I supply were really chuffed. There’s a lot of support and I could probably double production tomorrow and have enough customers – so we’ll be back and we’ll be better.